Imagine a retreat focused solely on you, your spiritual expansion, and how to expand your health, happiness, and fulfillment in life. This diverse retreat covers many topics to help you co-create the life you desire. Live the life of your dreams. Join this journey and experience Kundalini yoga, ancient meditations, developing inner strength, self-love, and the expansive practice of using crystal singing bowls to create the shift you desire. Experience your own sacredness and go deeper while in the tranquil beauty of the Sonoran desert with self-renewal, reflection, and private time to wander. You will be staying at the Scottsdale Links Resort. You get the "total package" when it comes to panorama in the Scottsdale area, from the vast desert with its unique and unusual cacti to the palm-lined streets or the stark mountain views. In this part of Arizona, and especially at the Scottsdale Links Resort, whatever the view is, it will take your breath away. Experience daily yoga, meditation and sound alchemy with Diane. Your retreat includes daily kundalini yoga, yogic philosophy and sound healing as well as, daily adventure excursions hiking, botanical garden visits and more. Plus, there is plenty of free time to experience your own sacredness and go deeper while in the tranquil beauty of the Sonoran desert with self-renewal, reflection, and private time to wander our luxurious setting in Arizona’s desert oasis! Plus, time to shop and explore Old Town Scottsdale, too! The retreat includes daily 2 hour excursions: hiking, botanical gardens and more. 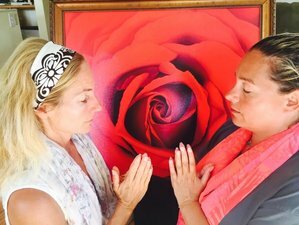 Diane Cline, RYT, is a leader in global consciousness, life coach, sound healer, medicine woman, and enthusiastic about serving you ! Diane considers her retreats "Empowerment retreats " where you are learning many ways to empower your life. As the founder of Yoga Inspirations, she has award-winning DVDs and has served over 7,000 people while on Kauai. She is especially passionate about helping people release physical ailments, old traumas ,habits & sharing a Peaceful way of Living. Propelled by her love for humanity, she dedicates her life to serving and uplifting others. The retreat will take place in the amazing beauty of the Sonoran desert near Scottsdale, Arizona. Daily breakfast and dinner is included in the price. Yoga Inspirations features Diane Cline who leads empowering retreats four times per year in Hawaii and Indonesia. The retreats are open to all levels and ages.